Moore Colson, an award-winning accounting, consulting and advisory firm in Atlanta, has been ranked as the number one Best of the Best Accounting and Advisory Firm in the United States for 2017 by INSIDE Public Accounting (IPA). 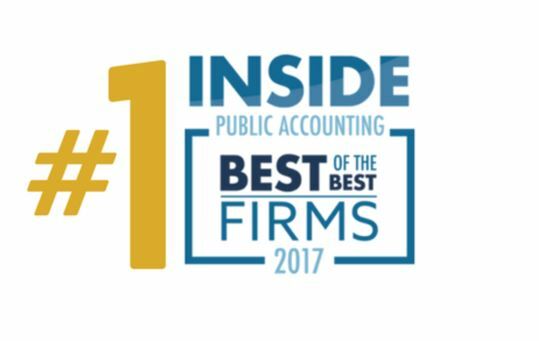 Moore Colson, an award-winning accounting, consulting and advisory firm in Atlanta, has been ranked as the number one Best of the Best Accounting & Advisory Firm in the United States for 2017 by INSIDE Public Accounting (IPA). In addition to the number one ranking on the Best of the Best list, Moore Colson received several other accolades from IPA in 2017, including Best of the Best Fastest-Growing Firm, Top 200 Firm, 200 Fastest-Growing Organic Growth Firm, 200 Fastest-Growing All Growth Firm and Fastest-Growing Over $5 Million Firm. This is Moore Colson’s fourth consecutive honor as one of America’s Top 200 CPA and Advisory Firms, and its fifth consecutive award for a Best of the Best Firm. IPA has nearly 30 years of experience in independent reporting, surveying and benchmarking, and has ranked the highest performers in the accounting profession for more than 20 years. Each firm is rated on more than 70 unique metrics with an ever-evolving proprietary formula with a key focus on staffing, training, governance, organizational structure and strategic focus. In 2017, 587 firms were eligible for this accolade and 50 firms were ranked on the Best of the Best list. Moore Colson has been providing accounting, advisory and consulting services to mid-market businesses and Fortune 500 companies in the Southeast and nationwide since 1981. Headquartered in Atlanta, Moore Colson is one of America’s largest and top award-winning firms delivering innovative and practical solutions in a true partnership model. Only Moore Colson provides the expertise, relentless integrity and personalized experience to help your company achieve its business goals.